Garvin’s Sewer Service provides preventative maintenance services to help minimize the likelihood of a backup caused by roots growing in the sewer line. 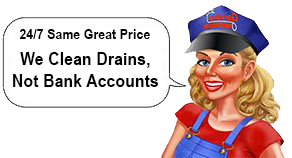 PLUMBING, DRAIN AND SEWER CLEANING FOR YOU! Since 1940, Garvin’s Sewer Service has become a mainstay of the Denver business district. We were the first drain cleaning company in Denver, and we have stayed true to our roots and continue to specialize in drain cleaning and sewer service. We’re family owned, and we’re currently in the third generation of ownership. We’re problem solvers, the ones that can fix the problem when nobody else can! But the main reason we’re still going strong is integrity. We treat our customers fairly and honestly, the way we want to be treated. 70% of our clientele comes from referrals, and we even have third generation customers.